Students will be dismissed from school at 12:30 on March 29, 2019. 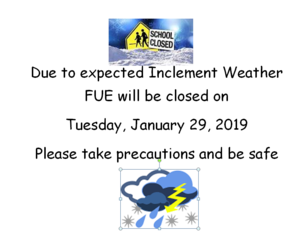 FUE presents Family Night with Math and Science on 2/5/2019 from 5:00 to 6:30 p.m.
FUE presents the 2019 Sweet Heart Dance 2/9/2019 from 5:00 - 7:00 p.m.
Congratulations to Mrs. Betty .J. Marsalis for being chosen as the 2018-2019 Elementary Principal of the Year! Ferriday Upper Christmas play, on Friday, December, 7 at 9:00 am. Students may wear Christmas shirt or Christmas color shirt with Khaki school pants.